Mexico is my favorite country in the world and it’s my absolute favorite place to eat. The country is full of gorgeous beaches, underwater cenote swimming holes, ancient Aztec and Mayan ruins, and modern metropolitan cities full of world-renowned restaurants and museums. I love the country so much that I’ve made at least a dozen trips there and now help travelers plan their own adventures to Mexico. I also lead TWO group tours there: Day of the Dead in Mexico and Vegan Mexico City. Like many countries, Mexican food, climate, and friendly bug populations can put a damper on vacation. 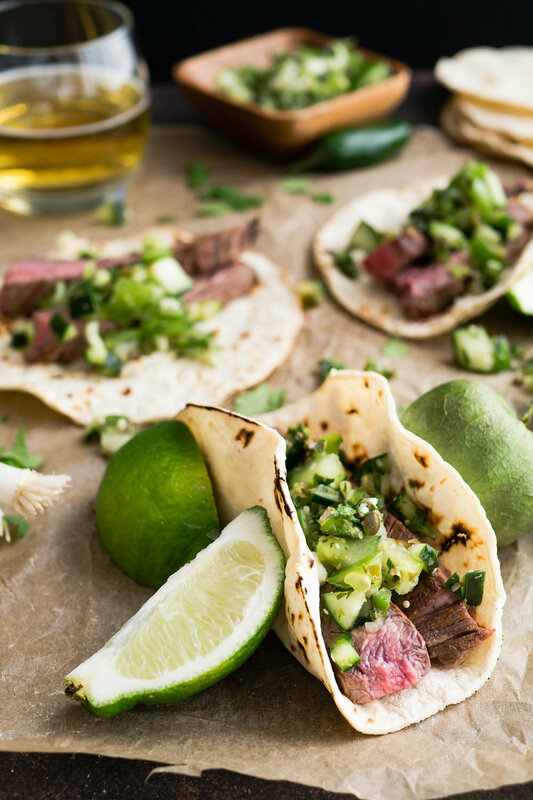 Follow the steps below to ensure a safe, fun trip, complete with tacos and tequila! During my first trip to Mexico in 2000 (thank you, high school Spanish Club! ), I suffered from heat stroke in Acapulco and had to spend my last day of the trip in the hotel room, nauseous and badly sunburned. When I went back in 2002, I ordered a gigantic meaty sandwich from a street cart just before boarding my plane home, then spent the next week in the bathroom regretting it. I went vegetarian shortly after but that didn’t stop me from eating food from questionable sources. On a road trip through San Luis Potosi in 2015, I sampled a Mexican friend’s tamarind juice at a street festival. It was delicious so I ordered one for myself. Then I ordered another. Then I woke up the next morning dizzy and sweaty while my local friend experienced no symptoms. 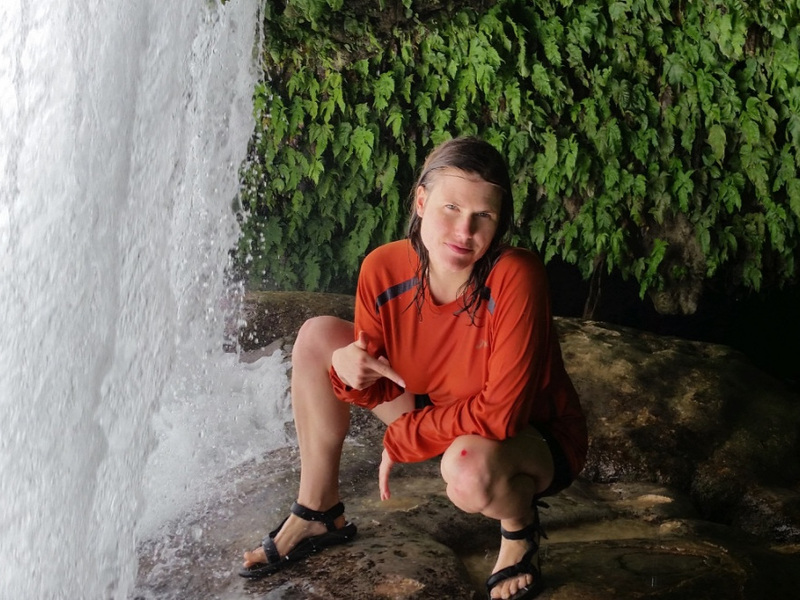 We only had a few days left in the region so I proceeded to go hiking through Aztec ruins in the jungle, looking for dense foliage to duck behind and squat. I laid low at our campsite for a couple days, having to hop on rocks to cross a river at night to get to the bathroom, praying to make it all the way to the toilet and hoping that the night security guard wouldn’t be standing close enough to hear me inside the bathroom. He was. After a couple days, I went on a waterfall jumping tour and thanked God that I didn’t have any accidents. Can you imagine some aspiring Youtube celebrity with a GoPro catching me underwater pooping myself? That is NOT how I want people to learn about my travel company! After a whale-watching hitchhiking road trip through Baja California, I enjoyed a torta sandwich at a street food cart before boarding a plane to Havana to attend President Obama’s inaugural visit to Cuba in 2016 (detailed in my very first blog post!). I was dizzy during the flight; had to lie down on the ground outside the airport for two hours, as Obama’s arrival had closed down the freeways; and I was so sick that I couldn’t leave the house all week. I had to watch all the action from a staticky black and white TV in between shuffling to/from the bathroom. I’d like to say I made it all the way to bathroom on time but I’m not sure that would be entirely true. My friend nearly reported me to immigration, fearing I had Zica, then was convinced I had a problem with my ovaries, and later was certain I had appendicitis. It turns out, as I would learn from the medic station at the Rolling Stones’ Havana concert, it was just really bad food poisoning. By the way, there were no bathrooms at the concert so I had to walk around the neighborhood, knocking on doors and asking strangers to let me in. Since then, I’ve learned how to avoid getting sick in Mexico and haven’t had any further incidences. Furthermore, I’m very happy to say that nobody on any of my group trips to Mexico has gotten sick. Mexico has some of the best street food in the world. Mexican street food is world famous for good reason but it’s also known to cause Montezuma’s Revenge. As a long-time street food connoisseur myself, I would NEVER tell anyone to avoid street food altogether, unless that person has minimal travel experience and an extremely sensitive stomach. That said, there are a few basic warning signs to look for among Mexican street food vendors. If you see these signs, keep walking! As basic as it sounds, hand washing is a simple way to avoid getting sick while traveling. If soap and water aren’t available (and they often aren’t), be sure to have antibacterial hand sanitizer with you. Many street food stalls in Mexico have a large container of hand sanitizer for customers to use. If you have a sensitive stomach, certain probiotic pills can help build up your gut health and decrease your chance of getting sick. My favorite brand is listed in my travel store (and shown below). For best results, start taking it a week BEFORE your trip then continue taking daily DURING your travels. Grapefruit seed extract, oil of oregano, and blends such as Thieves (below) are natural anti-bacterials that can easily be added to water and taken daily during a trip. You may also want to pack anti-diarrhea medicine, such as Imodium, and speak to your doctor about a prescribed antibiotic to keep on hand in the event of serious illness. Tap water in Mexico is NOT safe to drink. You may see some locals drinking it but that does not mean that it is safe for travelers that are not accustomed to it. Fine dining restaurants and establishments catering to tourists will often use bottled water in ice cubes and drinks. ALWAYS ask a bar or restaurant if they use bottled water to make their ice cubes and drinks. Be especially cautious of fresh juices, which are often fresh juice blended with water. This is particularly the case at street food juice stalls. Bottled water is the safest way to go. However, when purchasing bottled water from street vendors, DO NOT let the vendor twist off the cap, as it’s possible they’re trying to sell bottles that have been re-filled with tap water. This problem is not rampant but it does exist in Mexico and many other countries. Always confirm the bottle cap is properly sealed and twist it off yourself. Though some people advise using bottled water to brush your teeth in Mexico, I’ve never experienced a problem brushing with tap water (nor have dozens of people on my Mexico group tours). Just be sure to not swallow the water that you use to brush. However, if you have a particularly sensitive stomach, you may want to use bottled water just to be safe. Want to help the environment and avoid bottled water altogether? Try a reusable water bottle with a filter. My favorite can be found in my travel store and is featured in the video below. It got me through a three-week trip to Mexico, plus four months in Peru, Bolivia, Cuba, and Malaysia! Be careful when it comes to salads and fruit. Raw fruits and vegetables may or may not have been washed with purified water and in some cases, may or may not have been washed at all. When in doubt, douse your food with fresh lime juice. Lime wedges are ALWAYS served with food in both restaurants and food stalls and the juice helps kill bacteria. To be extra safe, stick to fruit that can be peeled, such as bananas and mangoes. Prepared fruit (such as sliced guava, papaya, and pineapple) may look delicious, but you don't know how clean the preparer's hands were or how long the fruit has been sitting out in the sun, exposed to insects and airborne bacteria. Spicy food may be the essence of Mexican cooking but it’s not for everyone. Note that green sauces are often the hottest (and most flavorful!) so don’t be fooled by what looks like a cool avocado sauce. Also note that some sauces, especially on street carts, may be prepared using tap water. If you’re suspicious and can’t confirm, it’s best to opt for a squeeze of fresh lime juice, a scoop of pico de gallo (fresh, chunky salsa), and/or a whole jalapeno. Heatstroke (sunstroke) is real and it can totally ruin your vacation. During my first trip to Mexico in the summer of 2000, I got too excited about the sunny beaches in Acapulco and wound up spending two days passed out in my hotel room nauseous and with a terrible headache (not to mention massive sunburn). Sunstroke is most common in summer months, when temperatures are at their highest, and/or in conjunction with strenuous physically activity such as hiking through Mexican jungles - with our without jungle diarrhea :) - and climbing Mayan ruins. Per the Mayo Clinic, if you feel you’re suffering from heatstroke, get in the shade, remove excess clothes, cool your body (ice, water, fans), and seek medical help. 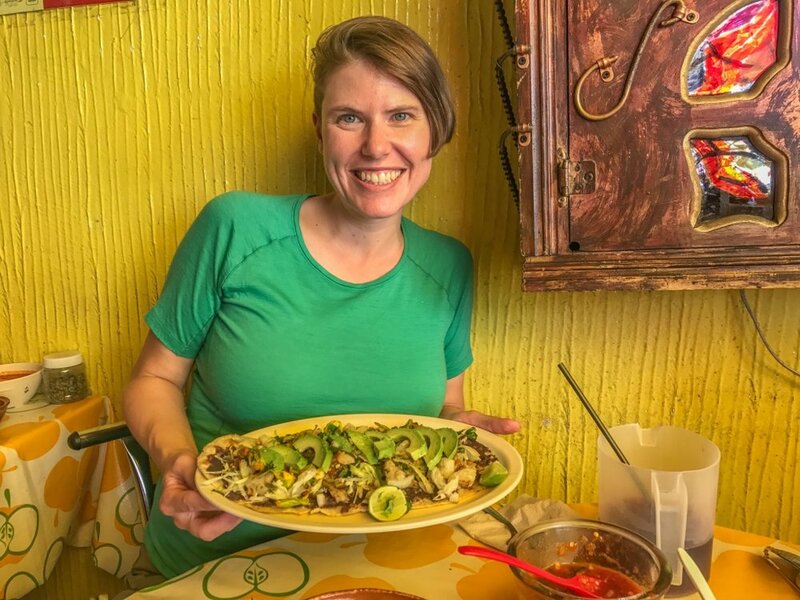 I’m vegan and lead Vegan Mexico City tours - what the heck do I know about eating meat in Mexico? Well, I began traveling to Mexico as a happy (and extremely naive) meat eater in 2000, enthusiastically scarfing down Cubano sandwiches from every street cart in sight. Mexican Cubano sandwiches are nothing like actual Cuban food (where spaghetti, pizza, and mustard are oddly popular), and are loaded with astounding amounts of ham, pork, sausage, cheese, and mystery meat. You would think that several days in the bathroom would have taught me my lesson but questionable meaty tacos on my next trip resulted in additional quality time on the toilet. If you’re going to eat meat in Mexico, avoid eating it rare. Opt for medium-well done, even in nice restaurants. Found a cute shack on a non-touristy beach offering fresh grilled fish and ceviche? Know that seafood is particularly dangerous and should be completely avoided at street food stalls and restaurants that don’t have proper refrigeration. Follow the street food safety tips above and take special note of meat left out in the sun/air all day. While tainted tap water may be an easy scapegoat for sickness, certain bouts of illness can actually be attributed to over-indulging in alcohol and food. Rich, salty, or spicy foods and alcohol can dehydrate you so it’s extra important to stay hydrated (with filtered or bottled water). Sip water throughout the day and alternate alcohol with water during a boozy night out. A pinch of salt and a bit of lime in water can work wonders for hydration and can help you avoid missing a day of fun due to a self-induced headache. Mosquitoes, ticks, and fleas all exist in Mexico but fortunately, they are rare, especially in large cities and resort areas. If you’re heading to rural areas, you’ll want to reduce risk by covering up (long sleeves and pants) and using strong bug repellent. The higher the percentage of the active ingredient, the stronger the protection. Zika has been recorded in parts of Mexico so the CDC recommends that pregnant women avoid Mexico entirely. 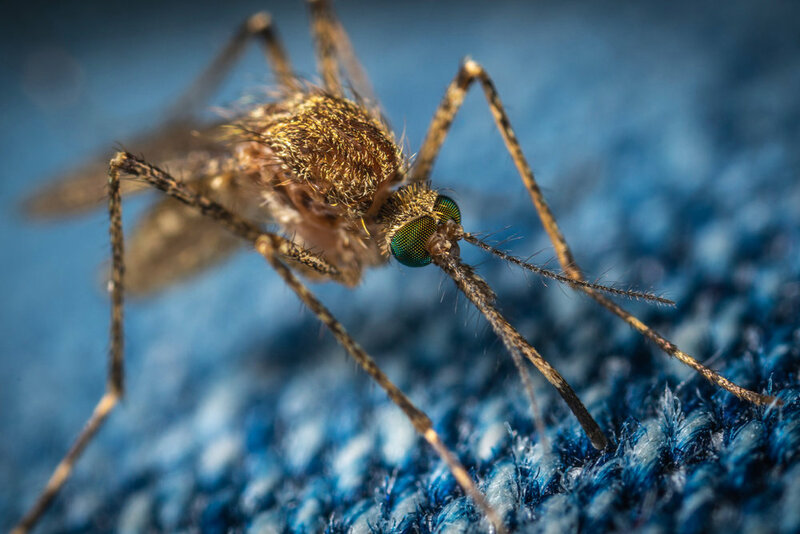 Malaria has also been recorded in Sonora, Sinaloa, Chihuahua, Durango and Narayit along the Pacific Coast and Chiapas, Campeche, and Tabasco in the south. Dengue fever is endemic in Tabasco, Jalisco, Guanajuato and Quintana Roo, with increased risk along both coasts, including Baja California. Peak season is during the rainy months of July through October. If you’ve read my post Why You Should Buy Travel Insurance, you’ll know that I’m a huge fan of travel insurance, and of World Nomads, in particular. Travel insurance is an important part of any trip abroad and could come in very handy if things in Mexico don’t go exactly as planned. I’d love to hear about your own experience traveling to Mexico or other countries where food safety is a concern. Do you have any tips and tricks you’d like to share? Please leave a comment below!